New York City Department of Environmental Protection Commissioner Emily Lloyd joined members of the Newtown Creek Monitoring Committee (NCMC) tonight to celebrate the lighting of the digester "eggs" at the Newtown Creek Wastewater Treatment Plant in Brooklyn. The lighting arrangement was designed by the French design firm L'Observatoire International as part of the upgrade of the plant. The illuminated eggs will be visible from vantage points in Brooklyn, Queens and Manhattan and will serve as a landmark for travelers on the Long Island Expressway, the Brooklyn-Queens Expressway and the Kosciusko Bridge, among other locations. "It is thrilling to see form and function beautifully expressed in the structure we are illuminating tonight," said DEP Commissioner Emily Lloyd. 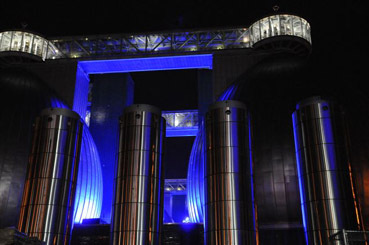 "Each evening we will be reminded of the elegant combination of engineering and art in the blue aura of the structure. Under Mayor Bloomberg's leadership, this is a city where previously throwaway stretches of waterfront are being revitalized and repopulated. This stunning plant demonstrates that with care even the most utilitarian infrastructure can be an exciting and inviting neighbor." The digesters will process up to 1.5 million gallons of sludge everyday. Each egg, clad with low reflectivity stainless steel, is 145 feet high and 80 feet in diameter. The eight eggs were welded on site from pieces that were brought from Texas and fabricated by Chicago Bridge and Iron. It took three months to assemble each one. Although the weight for each egg is around 2 million pounds when empty; it is calculated that they may weigh up to 32 million pounds when processing sludge. The blue lights illuminating the eggs were designed by artist Hervé Descottes of L'Observatoire International, an American/French company. Hervé Descottes is known for lighting projects ranging from the diverse architecture of Steven Holl and Frank Gehry, to local projects such as Lincoln Center, the Highline, and Columbus Circle. The first four eggs came into service on May 23 and the rest will come online by the end of the year. "A diaphanous layer of blue light visually identifies and unifies the water treatment plant, which contrasts with the bright orange lights of the surrounding city. The luminous membrane serves as a protective layer, defining the extent of the entire plant, while also serving as a canvas for the bright white lights that define the plant's various functions," said L'Observatoire Designer Hervé Descottes. "The most active areas, such as the loading docks, blaze in contrast to the blue monochromatic field. Pedestrian walkways carve bright shimmering lines against a background of forms bathed in blue light, and gleaming yellow lines and points of bright shimmering lines against background of forms bathed in blue veil expressing the dynamic through light." Digesters play a critical role in the wastewater treatment process. During the wastewater treatment process, organic material called sludge is removed from sewage. Sludge is "digested" and processed for beneficial use. Inside of digesters, bacteria break down this sludge into more stable materials. Heat, lack of oxygen, and time are all needed for this to happen. Much of the sludge is converted into water, carbon dioxide and methane gas. The remaining is called digested sludge. Digested sludge is then dewatered to form a cake, which, after additional processing, can be beneficially used as a fertilizer. The eggs are state of the art in digester design as the shape assists in concentrating grit at the bottom of the tank, mixing for improved digestion and the concentration of gas at the top of the tank. Each egg holds 3 million gallons of sludge. The Newtown Creek plant is the largest of New York City's 14 wastewater treatment plants. The plant serves approximately 1 million residents in a drainage area of more than 15,000 acres (25 square miles). The plant began operation in 1967 and currently treats 18% of the City's wastewater with a capacity of 310 million gallons per day (mgd) during dry weather. Upgrade work began in 1998 and will eventually raise plant capacity to 700 mgd during wet weather storms. The upgraded plant will serve a projected population of 1.33 million residents within the relevant drainage area by 2045. Last September, DEP opened the Waterfront Nature Walk at the Newtown Creek plant, affording the public their first waterfront access to Newtown Creek in decades and advancing Mayor Bloomberg's PlaNYC goals, ensuring that the public has broader access to the waterfront and increasing water quality throughout the City's waterways. The Nature Walk was designed by renowned environmental sculptor George Trakas through the New York City Department of Cultural Affairs Percent for Art program in conjunction with DEP's ongoing upgrade of the plant. The quarter-mile nature walk offers stunning views of the City and of the nearby industrial landscape, as well as many unique architectural features, plantings and construction techniques that were designed by Trakas to evoke the rich, continually evolving environmental, industrial and cultural histories of the local area. DEP meets monthly with the Newtown Creek Monitoring Committee (NCMC), a committee of volunteers from the Greenpoint community, which was established in 1996 pursuant to a City Council resolution allowing the City to acquire property required for the upgrade of Newtown Creek WWTP. NCMC members are appointed by the local City Council member, the Brooklyn Borough President and Brooklyn Community Board #1. NCMC, with the assistance of its technical consultant, reviews and makes recommendations about activities associated with the treatment plant upgrade in order to mitigate potential impacts to the Greenpoint Community. NCMC worked with DEP to identify and design community amenities such as the Nature Walk, and is one of the longest standing citizen oversight committees in New York City. The committee concurred with DEP for the egg digester cladding and lighting. The New York City Department of Environmental Protection manages the City's water supply, providing more than 1.1 billion gallons of water each day to more than 9 million residents throughout New York State through a complex network of nineteen reservoirs, three controlled lakes and 6,200 miles of water pipes, tunnels and aqueducts. DEP is also responsible for managing storm water throughout the City and treating wastewater at 14 in-City wastewater treatment plants. DEP carries out federal Clean Water Act rules and regulations, handles hazardous materials emergencies and toxic site remediation, oversees asbestos monitoring and removal, enforces the City's air and noise codes, bills and collects on City water and sewer accounts, and manages city-wide water conservation programs.